The O4 wheelchair weighing scales, the 4Points weighing scales, have been specially developed for the specialist trade in cooperation with clients from various institutions in order to find the right balance for efficient wheelchair mobility. Thanks to the exact measurement results, the perfect wheel balance settings can quickly be found. The measurements offer a well-founded basis for medical treatment and transparent results for the healthcare professional and the O4 wheelchair dealer. 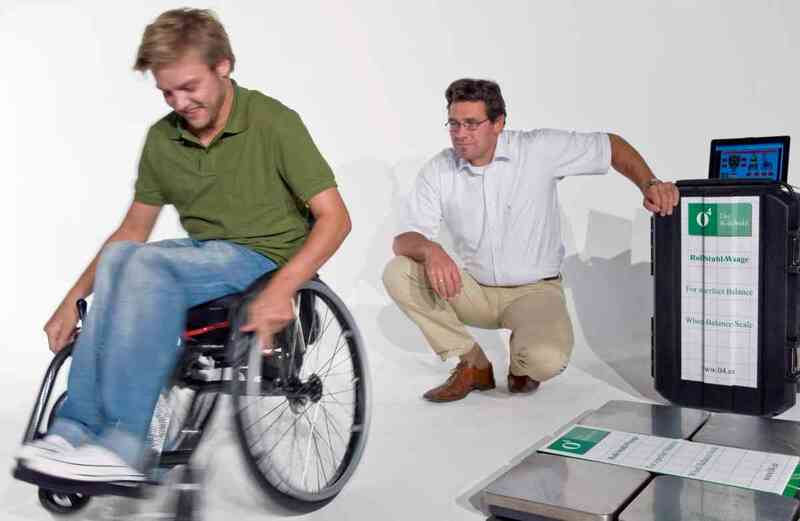 The O4 4-point weighing scale that is connected to a tablet or smartphone via Bluetooth can identify the causes of poor driving traits and loss of energy in wheelchair users. You can view the scale’s metrics in the O4 app. This information can be used to advise the wheelchair user regarding corrective measures. A correctly adjusted wheelchair is energy efficient and reduces pressure on your hands, wrists, arms, elbows and shoulders! The correct balance is important for efficient and safe wheelchair mobility. Our wheelchair weighing scales enable us to ensure more wheelchair mobility, efficiency, comfort and safety. If you would like to know more about the importance of balance in a wheelchair, please read our blog. "The O4 wheelchair weighing scales enable you to establish the centre of gravity of the wheelchair. The wheelchair user thus becomes aware of the factors that influence the riding behaviour."